Pizza party! There are some days when you just need pizza…. it’s science. I absolutely love pizza but don’t eat it as much as I want to because it’s so bad for you. Jim and I have been talking for a while about using our trusty cast iron pan to make a pizza. We finally got around to it, and I’m so glad we did. Don’t be disappointed when you get to the recipe below. It’s not a healthy recipe, but it’s definitely healthier than anything you’d get from one of the fast food pizza chains. There aren’t 2 cups of artificial butter flavored spray sogging up the crust here. We’ve come up with a basic pizza crust that works really well for a pan pizza. It’s dense enough to hold up to the toppings and doesn’t dry out too much from being cooked in the cast iron pan. The thing about this pumpkin bread is that it really doesn’t taste anything like pumpkin. If pumpkin wasn’t in the name you wouldn’t know it had any in it. It is basically an amazing Chocolately Bread and the pumpkin just gives the right amount of moistness to this bread. Seriously guys, trust me and go make this right now! This bread is basically a chocolate lovers dream come true. It’s breakfast, a snack, dessert all rolled in to one lovely package! And honestly the ingredient list is not too bad…so you can actually feel good about eating it! The moistest, chocolaty-est, and most delicious pumpkin bread that I've ever made. 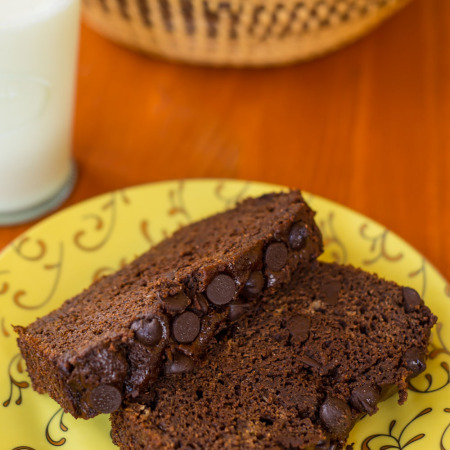 This Chocolate Chip Pumpkin Bread is my family's new favorite. Preheat oven to 350 F. Grease an 8x4 inch baking pan. In a large bowl whisk together yogurt, pumpkin, coconut oil and coconut milk until combined. Stir in sugars until well combined. Add flours, cocoa powder, baking soda, and salt. Stir until just combined. Sprinkle remaining 1/4 cup chocolate chips over batter. Bake for 40-45 minutes, or until a toothpick inserted in the center comes out clean. It's okay if it has some melted chocolate on it, but it shouldn't have any crumbs. This post is sponsored by Melissa’s Produce. Their steamed veggies are one of my staple grocery items. We used Melissa’s Steamed Artichoke Hearts to make this delicious pasta. Enjoy! I’ve always been a bit intimidated by artichokes. I’ve had them in restaurant dishes several times, so I know I like them. But that green, spiky looking vegetable in the grocery section is another matter entirely. I’ve never cooked with them, and didn’t really know how to. So I was excited to get my hands on some of Melissa’s Steamed Artichoke Hearts. They took all of the intimidation (and the hard work) right out of the equation. The artichokes are ready to just throw into a recipe… so fast and simple! The artichokes come vacuumed sealed to preserve their just picked flavor. You can pick them up in the refrigerated section of your grocery store and have them on hand for when ever you need them. I love how convenient this is and how I don’t have to worry about them going bad before I get the chance to use them! Another great thing about Melissa’s artichokes is that they are Non-GMO and contain no allergens. This recipe is super-simple and very healthy. I like to roast tomatoes for a few minutes before adding them into a sauce because I think it makes them a tad sweeter. Adding a healthy splash of a sweeter white wine (we used a Vintner’s White from San Sebastien Winery in St. Augustine in this recipe) certainly helps as well. The artichoke hearts and onions worked well with the roasted tomatoes and resulted in a nice, chunky sauce. We like our pasta sauces very rustic, so feel free to chop your veggies a little finer if you prefer it that way. Tagliatelle goes great with this rustic sauce comprised of roasted tomatoes, artichokes, and onions. Peel, quarter, and remove the cores from tomatoes. Drizzle with olive oil, salt, and pepper and roast for 20 minutes. Add the tomatoes (and any liquid) to a large pan over med-high heat. Add onions, garlic, artichoke hearts. Sautee for 10 minutes, breaking up the tomatoes with a wooden spoon. Add lemon juice and white wine. Sautee for 10 minutes more, stirring often. Check for seasoning and serve over tagliatelle. You can substitute vegetable stock or water for the white wine. The sauce for this pasta is so light but so flavorful. The wine and lemon juice, as well as the copious amount of garlic, really make it stand out. Thanks again to Melissa’s for sponsoring our post. Check out Melissa’s full selection of steamed veggies… I love them all!